From the unfamiliar walls of a medical facility or hospital to an altered hotel room, the attempt to provide a comfortable environment to diagnose sleep apnea remains a problem. It is often difficult to schedule a convenient time for an overnight stay. Leaving loved ones for an evening or two and arranging care for your children or pets is not conducive to recording an accurate sleep study. 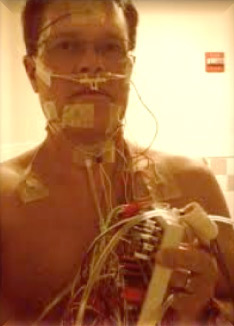 A conventional sleep study will require you to travel to the sleep lab. Once there, expect to be observed and filmed all night. The technician will apply 15 electrodes to your head and face with numerous sensors placed all over your body. If the unfamiliarity of sleeping in a different bed with cables attached to you is not intrusive enough you may find comfort in knowing someone is watching you all night. Log Z's does not recommend this conventional method for making the diagnosis of Obstructive Sleep Apnea. Log Z’s does recommend a full sleep study to make the diagnosis of Narcolepsy, Restless Leg Syndrome, identify Parasomnias such as Night Terrors and possibly Circadian Rhythm Disorders, however these sleep disorders combined do not make up 10 percent of all referrals to a sleep facility. Due to modern advances in sleep science, it is no longer necessary to travel to a hospital or an unfamiliar sleep lab to make the diagnosis of Obstructive Sleep Apnea (OSA). With today’s technology a patient does not need to endure the application of the cumbersome 21 electrodes and sensors originally required to make the diagnosis of OSA. Our approach allows patients to be tested in the comfort of their own home with as little technical intervention and disruption of their daily routine as possible. This approach to Polysomnography (PSG) can be achieved while maintaining the highest quality of sleep medicine. The equipment is sophisticated enough to make quick, accurate diagnoses. Yet, to the patient, the simplicity of the equipment ensures minimal interference with their normal sleep schedule: the equipment can easily be set up for their night study without assistance from a technician. Instruction on the use of the equipment takes less than 10 minutes to complete by a trained staff member This patient interaction encourages commitment from the patient that they will follow through with the doctor’s orders. The physician’s staff will be educated on how to properly instruct the patient on initiating the study. 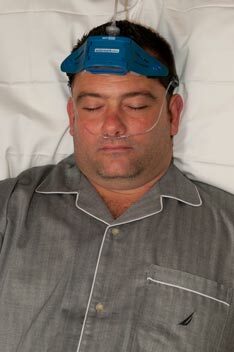 Furthermore, Log Z’s will compensate the instructor’s practice for educating each individual patient that undergoes a sleep study.